Internal structure of Sun The Sun is a giant ball of gas, mostly hydrogen and helium. The gas is so hot that the electrons have been stripped from the atoms. This type of gas is called a plasma. In the central core of the Sun, the temperature is high enough (15 million K) that hydrogen fuses into helium, releasing lots of energy. 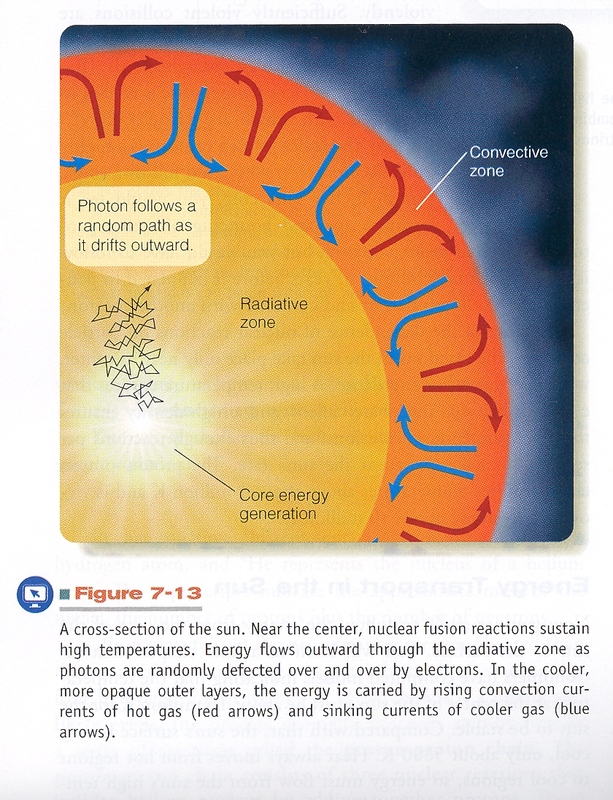 The fusion rate is such that the Sun has enough hydrogen fuel to last about 10 Billion years at its current power. Stars (like the Sun) that are "burning" hydrogen into helium in their centers are called main sequence stars. The energy makes its way from the core to the outside both by photons (radiation) bouncing around in the plasma and also, closer to the surface, by convection, which are "boiling" motions. Inside every star, there is a continual struggle between gravity, which wants to crush the star, and pressure (from hot gas heated by fusion) which wants to expand the star. 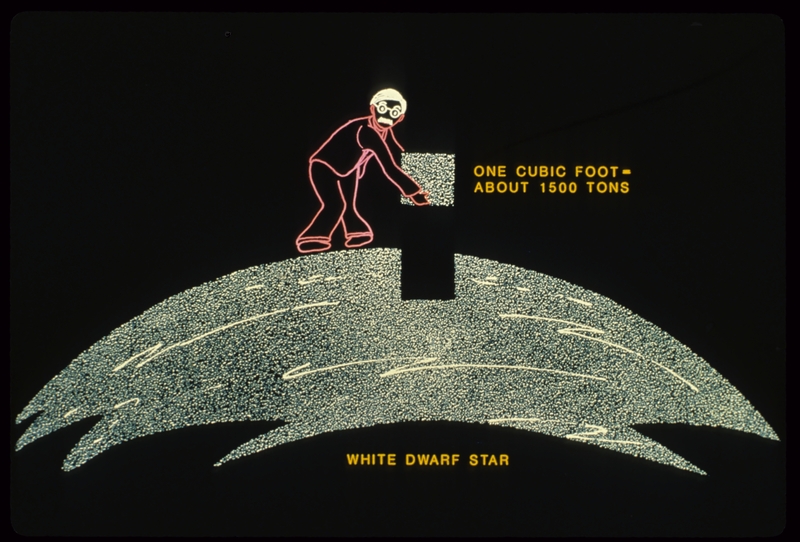 For rather complicated reasons, the star can spend a long time with gravity and pressure in a state of "truce". Gravity and pressure can stay in balance for a long time. Most stars spend most of their lifetime as main sequence stars. The main sequence part of a stars life is remarkably *stable* - the fusion rate changes very, very slowly, so the star has a stable power output or luminosity. A Good Thing for us!!! If the Sun were to randomly get much brighter or much dimmer, the temperature of the Earth would fluctuate wildly and life would be difficult or impossible. One somewhat surprising thing about main sequence stars is that the more mass a star has, the SHORTER its lifetime. More massive stars have more fuel, but they also have much larger luminosities than lower mass stars, so the more massive a star, the faster it burns though its hydrogen fuel supply. Massive stars live fast and die young. Although some stars live a long time (the less mass a star has, the longer it will live) all will eventually run out of hydrogen in their core. At this point, the truce between gravity and pressure begins to weaken. The star core starts to contract, which heats the core even more, due to the energy of gravity. Most stars become hot enough to fuse helium into carbon and oxygen (C+O). During this phase the outer parts of the star will swell up, and the star becomes a "red giant star". What happens after the helium is used up? 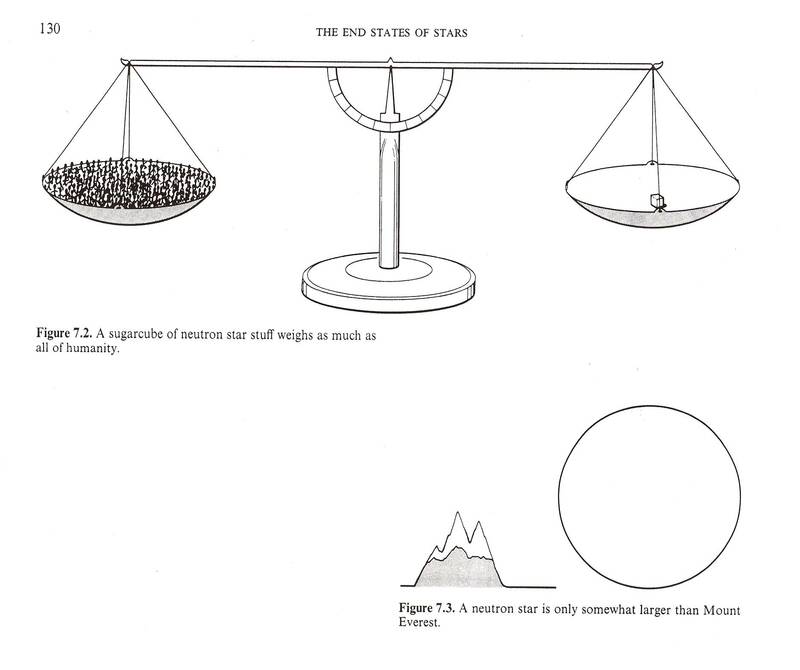 Well, that depends on the mass of the star. The Sun will have a core of C+O "ash" from buring helium. This core will become a white dwarf, an object about as big as Earth, but 300,000 times the mass. 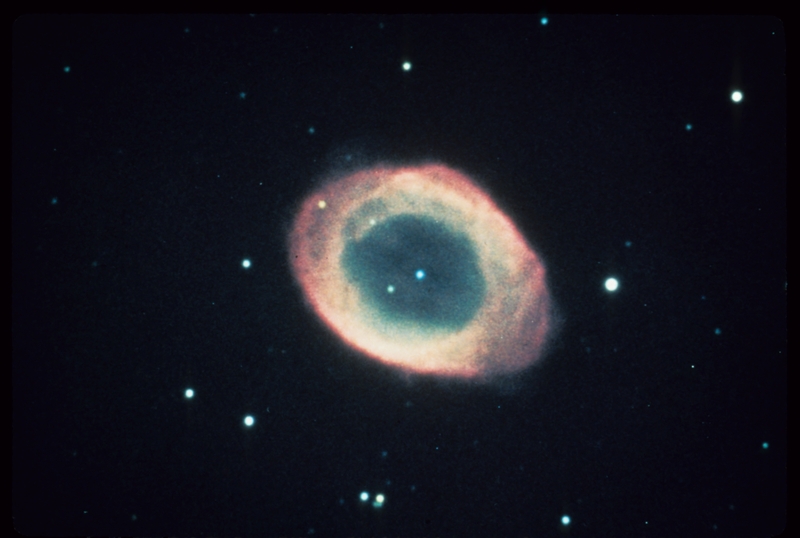 The outer parts of the Sun will be gently blown off, forming a temporary gas cloud or nebula called a planetary nebula (but it has nothing directly to do with planets!) The white dwarf will just slowly cool off over billions of years. Although some people call this a white dwarf "star", it is not really a star, because it has no fusion. Alex F. calls this a "retired star". For stars much more massive than the Sun, say 10 times as massive, death is MUCH more spectacular. These stars are hot enough to burn C+O into heavier and heavier elements, up to Iron. But Iron WON'T fuse. Once fusion stops, gravity tries to collapse the iron core. All hell breaks loose! 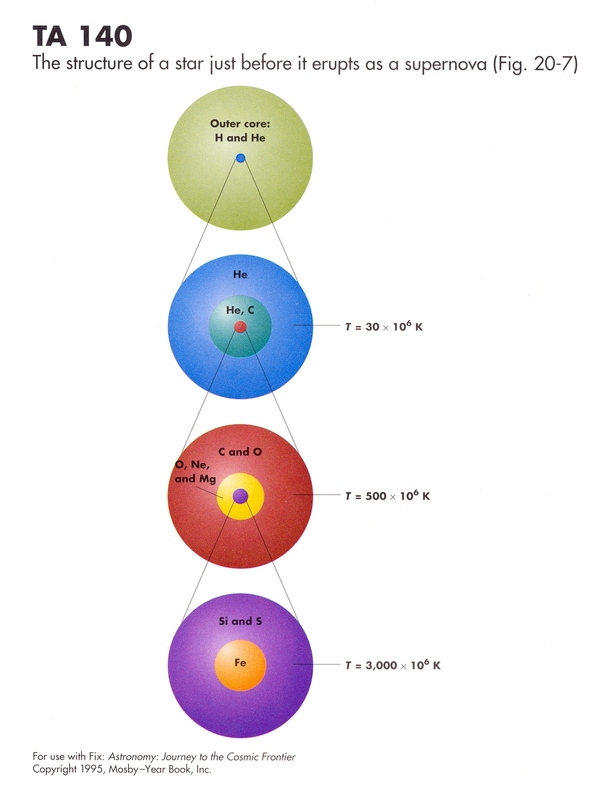 The stupendous pressure in the core pushes the electrons in the iron into the protons, forming neutrons. This releases enormous quantities of ghost particles called neutrinos. The iron core collpases, but, like a tennis ball squeezed in all directions, the core bounces, and along with energy of the escaping neutrinos, sends out a shock wave that sends most of the star expanding into space forming a nebula called a supernova remnant. The supernova remnant contains the heavy elements that had surrounded the iron core. These elements are now available to eventually form into new stars, and planets, and **US**. The iron core remains as a superdense ball of neutrons, about 10 miles across, but having the mass of several Suns, or an even crazier object called a black hole! YIKES!! WHAT A CRAZY STORY! BUT IT'S TRUE!! The supernova described above is called a core collapse or Type II supernova. Type II supernova can only come from massive stars. There is a completely different type of supernova which involves a white dwarf in a binary system (double star). If the white dwarf steals matter from its companion, it can become unstable and explode in a explosion known as a Type Ia supernova. These are two examples of planetary nebula, clouds of gas gently blown off a star like the Sun in its last stage of evolution. In the middle of the nebula is a white dwarf, an object about the size of the Earth, but with the mass of several hundred thousand Earths. Central core of massive star Massive stars (more than 8 or so times mass of Sun) are hot enough in their cores to fuse elements that are heavier and heavier. The star's core eventually looks like an "onion skin" of concentric shells of heavier and heavier elements towards the center- in the middle is a ball of iron (chemical symbol= Fe), surrounded by a layer of silicon (Si) and sulfur (S), which is surrounded by lighter elements (such as oxygen (O), neon (Ne) and magnesium (Mg), which is surrounded by a layer of carbon (C), and oxygen, and then helium (He) and hydrogen (H). This core is surrounded by a large shell of hydrogen and helium which has not undergone fusion. The fusion process stops with iron- iron cannot fuse, no matter how hot it gets. Once the iron core forms, the core will "implode", and the rest of the star will fall onto the core and "bounce", resulting a burst of energy that rips the star apart in a supernova explosion. Much of the the heavy element material is thrown away from the star to form a supernova remnant, which continues to expand and mix with the other gas around the star. The iron core becomes a neutron star or a black hole. Crab Nebula from HST. 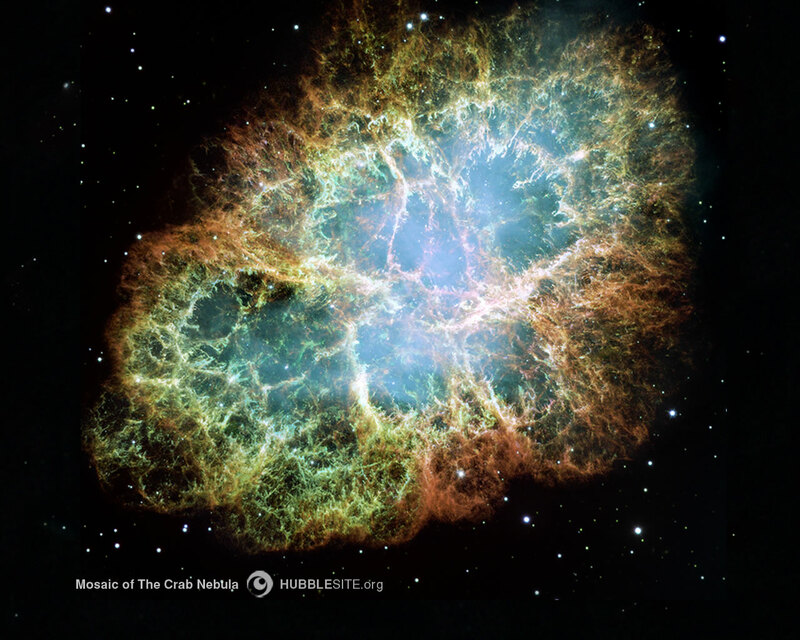 This is a very detailed image of the Crab Nebula taken with the Hubble Space Telescope. 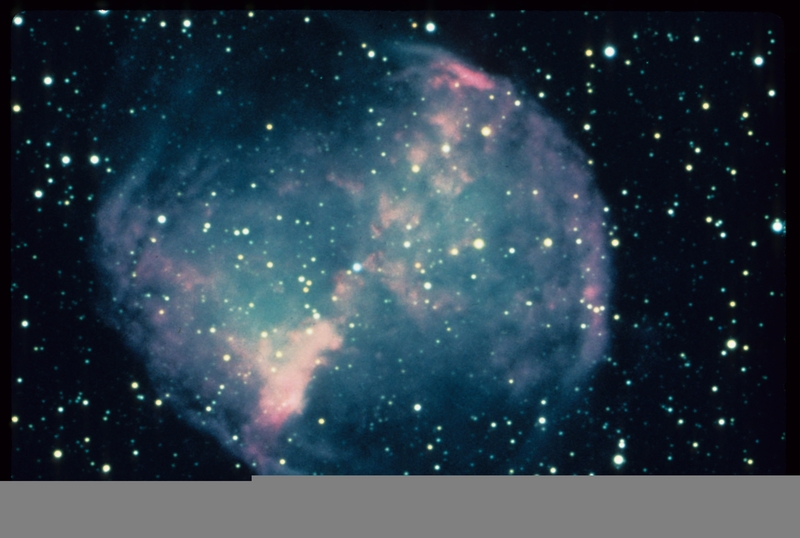 This is the expanding cloud of gas from the supernova explosion seen in 1054 AD. The diffuse blue glow is light from fast moving electrons. The delicate filamentary structure are strands of gas enriched in heavy elements- this gas was way down in the core of the star before the explsion, but was flung into space by the collapse of the iron core. This material will continue to spread out and eventually will be incoporated into new stars and planets and who knows what else- living creatures??? Neutron star density A neutron star is uncomprehensibly dense. Why? I showed a representation of an atom as a small nucleus with some tiny electrons around it- most of normal matter is thus empty space. In a neutron star, this empty space has been crushed out by the gravity of the collapsing iron core. Do such things really exist, or did some astronomer just think them up after too much whiskey on a cloudy nite? We see objects called pulsars which can only be explained as spinning neutron stars, so neutron stars DO exist! The Sun continually sends off particles into space from its seething surface. 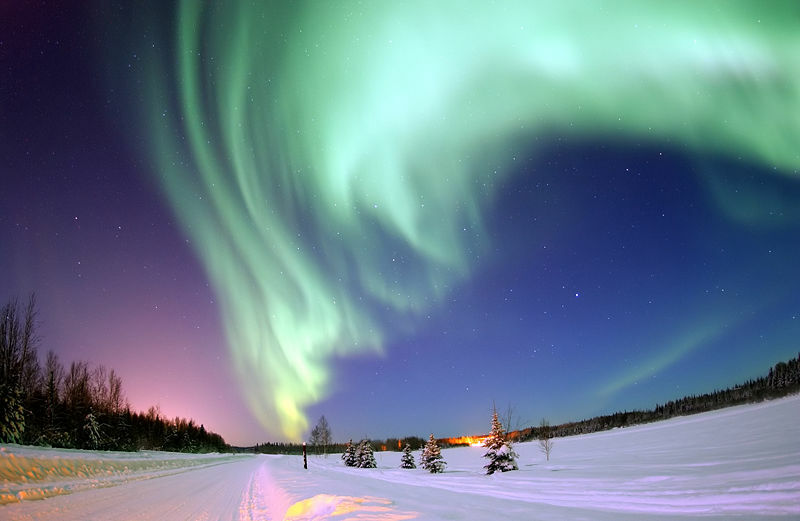 These particles are called the solar wind. In the outer regions of the Sun, the interaction of magnetic fields and plasma can build up energy that is released in the form of bursts called solar flares. These flares can disrupt communications on Earth, and even cause wide-spread problems with the electricity grid. The solar magnetic field get weaker and stronger with an 11 year cycle, for reasons we don't fully understand. We are coming up on a maximum in solar activity (solar max) in 2012. Expect problems with your cell phone! These are examples of an aurora, or northern lights. 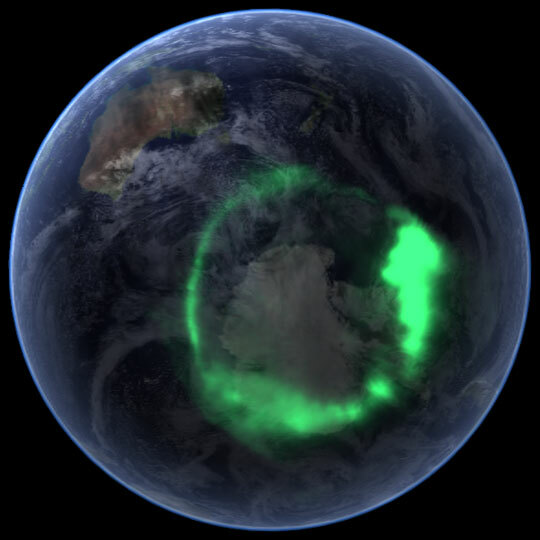 Aurora happen when gas particles from the Sun hit the upper atmosphere of the Earth and excite the electrons in the atmospheric atoms, causing the atoms to glow. This is the same basic physics that makes a neon light glow- collisional excitation of atoms, followed by emission of photons as the electrons "fall" down in energy level. 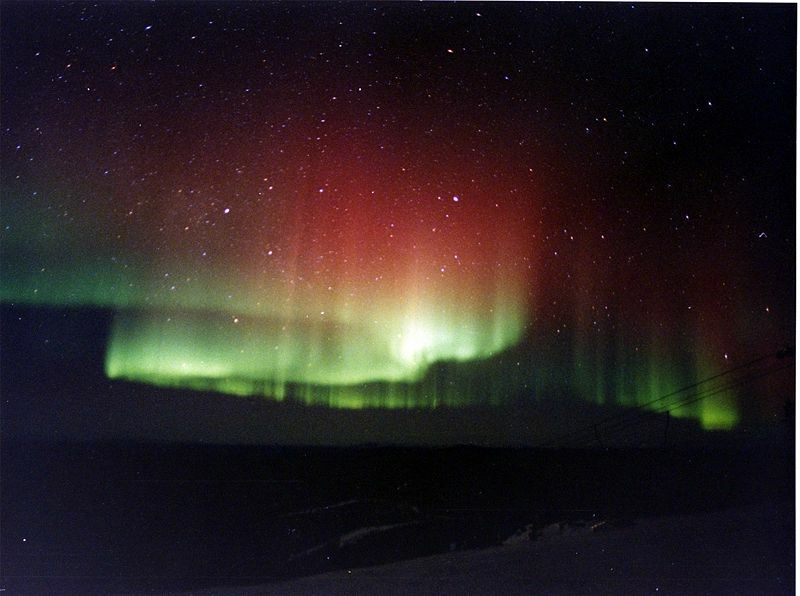 Aurora can take many forms- good displays can be seen as moving complex sheets of colored lights in the sky. 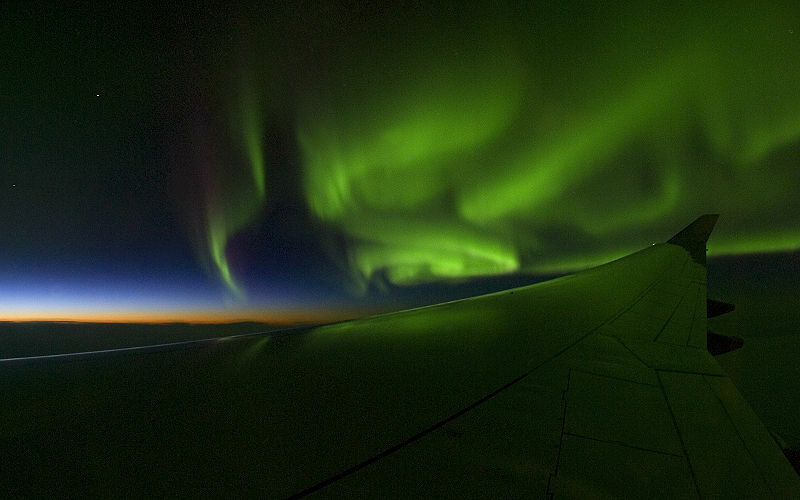 A quick internet search will yield many fine pictures of aurora. 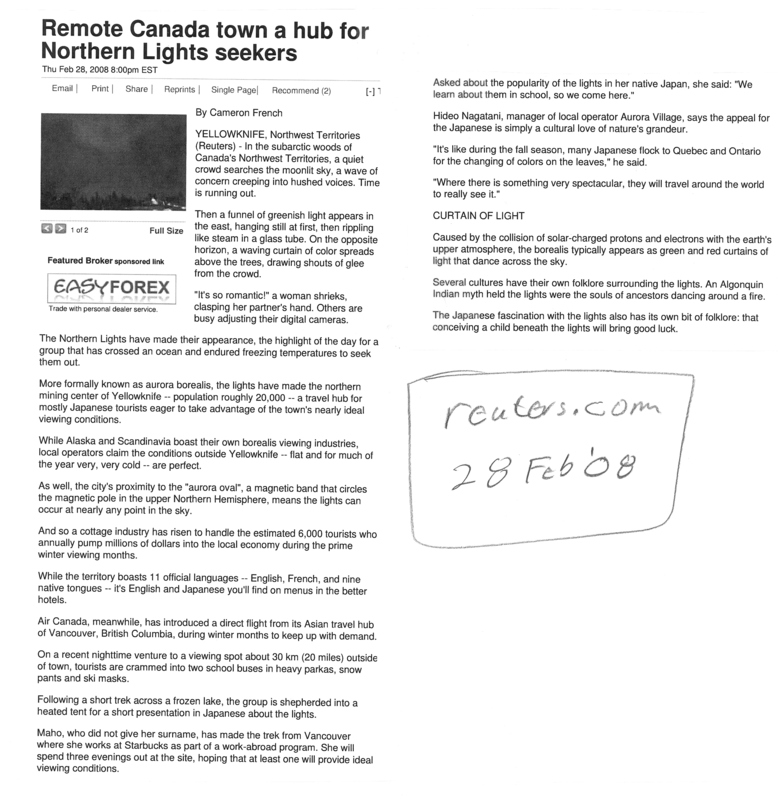 Aurorae in the northern hemisphere are most common in the far northern reaches (Canada and Alaska) because the Earths magnetic field helps "funnel" the particles from the Sun to those regions. Aurorae will begin to happen more frequently as the Sun becomes more active- activity is expected to peak in 2012. 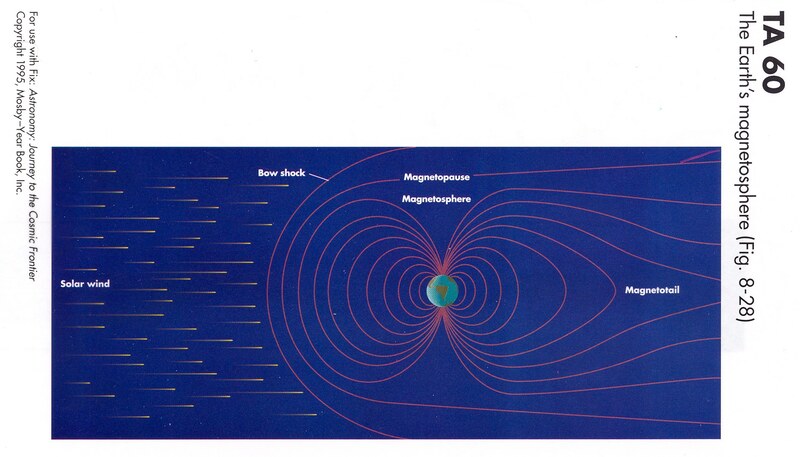 Earths magnetosphere The Earth has a planetary magnetic field, much like simple bar magnet. Near the Earth, the field lines have a classic North and South Pole, but further out the field lines are distorted by the solar wind and the Sun's magnetic field. Charged particles from the Sun (the Solar wind) don't like to cross field lines, so they are often "funneled" onto the Earth near the North and South magnetic poles of the Earth. The magnetic poles of the Earth are fairly near the rotational poles, but are not in exactly the same place. 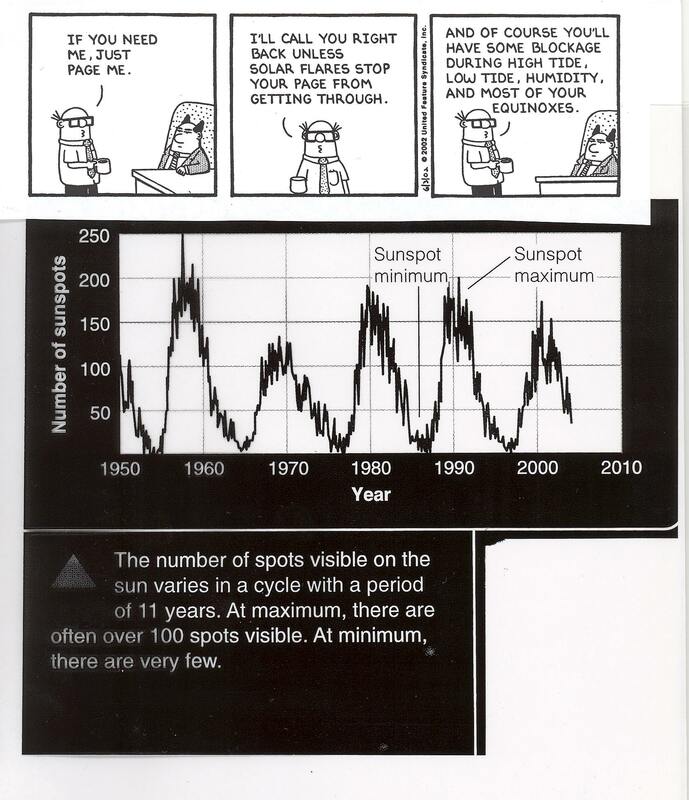 Solar cycle. The Sun's surface activity rises and falls with an 11 year cycle called the Solar cycle. 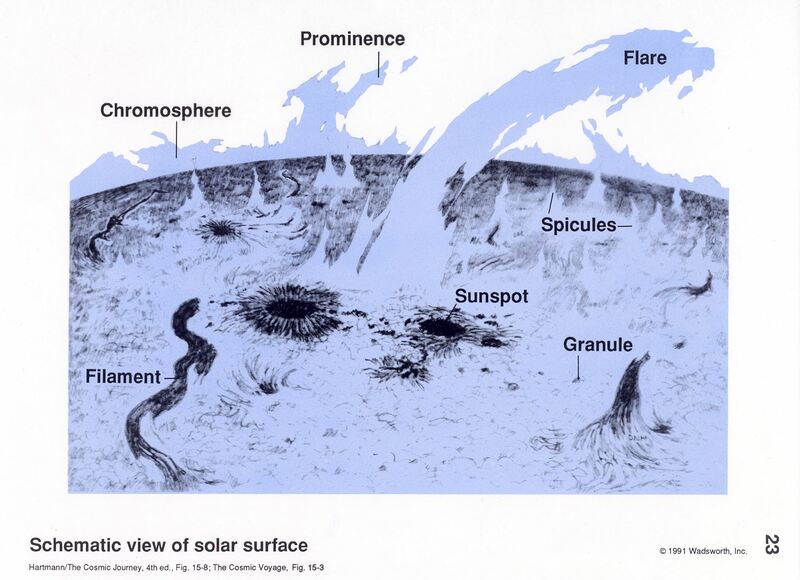 During times of high solar activity, there are many sunspots and flares. We are just entering the active part of the solar cycle. 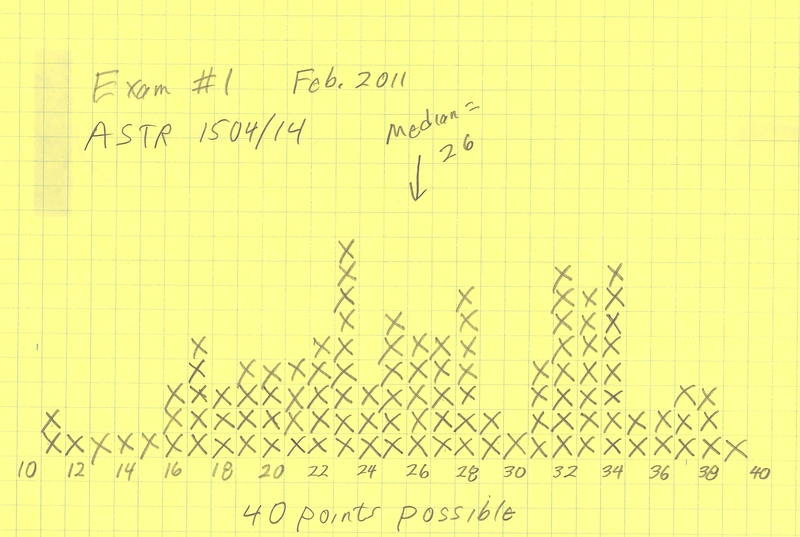 See a more up-to-date version of the graph on page 126 of book. Solar surface activity. There is no solid surface to the Sun - it is gaseous throughout. 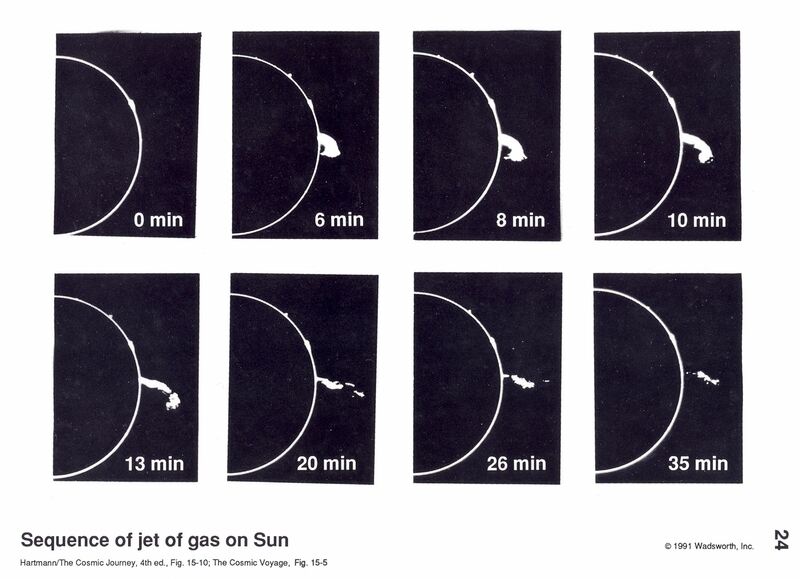 When we look at the Sun we see down to a layer of gas that is dense enough that we can't see any further. This "surface" looks like a boiling, turbulent liquid. Interaction of gas and magnetic fields produce many different phenomena, such as sunspots and flares. Sunspots look dark becuase they are regions slightly cooler than there surroundings, while flares are loosely "explosions" that can send of great clouds of gas from the surface of the Sun. Solar flare. This is a time sequence of a great cloud of gas, many times as large as the entire Earth, being ejected from the Sun by a solar flare. These photographs were taken with a special telescope that blocks the bright glare from the Sun, allowing the gas cloud to be seen. As this gas cloud moves away from the Sun, it may eventually hit the Earth and might cause aurora and/or radio communication disruption.